Enjoy a comfortable super-jeep ride through the biggest lava field on Earth along the volcanic system of fissures that is Laki. Home to the the deadliest volcanic eruption in Icelandic history-this area once flowed with 42 billion tons of lava. Today it is an incredibly strange and surreal desert landscape of vibrant green and yellow moss fields and canyons. Travel to the source of the lava to observe the 25 km-long fissure. Discover breathtaking crater lakes and hike through a canyon where a molten-rock river once flowed. During the eruption in 1783, an estimated 42 billion tons 14 km3 of lava poured out from 135 fissures and volcanic craters near the town of Klauster. The lava covered an estimated 2,500 km (965 square miles) of land. The eruption lasted 8 months and eventually killed 30% of the icelandic population and 50% of the livestock. The eruption affected the weather on a global scale and is one of the deadliest, if not the deadliest eruption in human history. It is estimated that more than 5 million people died the world over from weather change patterns. We start the trip at the village of Kirkjubæjarklaustur (AKA Klauster). We will drive some 50 km inland to the source of the eruption and climb the low Laki mountain where we can see the 25 km long crater row against the backdrop of the mighty Vatnajökull ice cap. We will hike along the canyon where the lava once flowed, and visit the crater lake with its pristinely clear water. 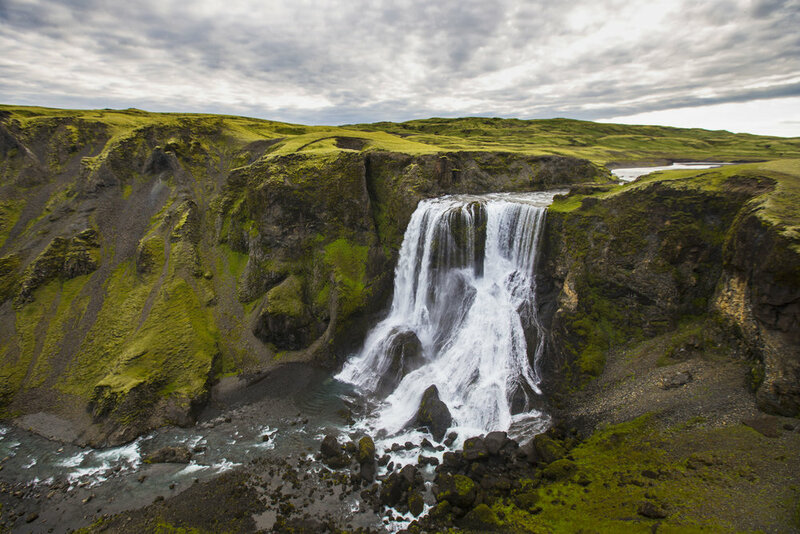 Before turning back to Klaustur we will visit the 80 meter high waterfall “Fagrifoss”, a fall that is not accessible without a 4x4 vehicle and therefore less frequented than other falls in Iceland. Personal and unique encounter with some of the hidden Gems of Icelandic Nature.